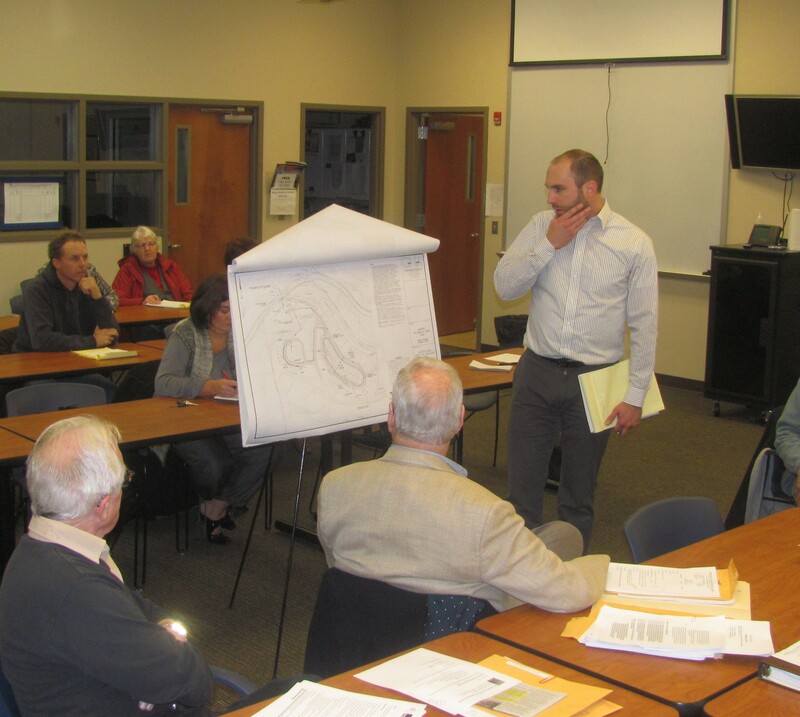 Matt Walsh, a project engineer for Colwell-Naegele Associates of Clarks Summit, shows members of the Wyoming County Planning Commission preliminary plans for the proposed Hayduk RV/Mobile Home Park which would be comprised of approximately 70 lots in Lemon Township. Members of the Wyoming County Planning Commission viewed plans for a proposed RV/Mobile Home park in the area of Avery Station and Rocky Rift Roads, discussed options for updates of the Subdivision and Land Development Ordinance (SALDO), and recommended several topics that should be addressed in the county’s Comprehensive Plan, which they discussed in an executive session after the regular meeting. In addition to granting preliminary and final approval for a one lot subdivision in Tunkhannock Township, board members gave final approval for the Jack Williams Tire Center project in Eaton Township, which had a grand opening celebration last month. When the agenda item was read by Chairman Wal Derhammer, it was quickly noted that the business was already in operation, and several board members expressed concerns that a number of projects of late have proceeded ahead of final approval by the Planning Commission. “They shouldn’t have occupancy until the county approves it,” Derhammer remarked. “The process was a little backward,” Wyoming County Planning Director Nicole Wootten concurred. Since the previous meeting, she related, the Jack Williams project managers had successfully obtained the final three permits they needed for storm water and waste management plans and PennDOT approval. Other board members mentioned that the planning commission only meets once per month, and projects shouldn’t be held up unnecessarily. “I think that this is something that should be part of our new Comprehensive Plan,” Rich Fitzsimmons suggested. In the meantime, it was generally agreed upon that as long as project managers are reporting regularly to Wootten and completing the permitting processes in a timely manner, Wootten has the authority to allow a project to progress at her discretion. “It’s a matter of getting all of the agencies on the same page,” she stated. Among the additional projects on the agenda were a minor subdivision report on the progress of the planned D&S diesel fueling station that might dominate the landscape along Route 6 at Adams Road in Washington Township. The project is not yet fully permitted, but the developers may clear trees and move ground in advance of such a point in time. Board members noted that foundation work has begun at the bottom of a steep bank that leads from a deep ravine up to the highway. “The topography is unbelievable for what they want to do,” said Fitzsimmons. Howard also noted that the small bank abutting the highway will likely have to be leveled off to provide a safe line of sight from the roadway. The board moved on to a presentation by Matt Walsh of Colwell-Naegele Associates engineering firm in Clarks Summit. Walsh brought preliminary plans for a proposed RV/mobile home park that would be constructed near Oxbow Lake, Avery Station Road and Rocky Rift Road in Lemon Township. No work has yet been done at the site, which would feature 57 RV lots and 12 lots for permanent residents in mobile homes. Walsh acknowledged that the plans, maps and drawings would not answer all of the questions raised by board members. He was there, he indicated, to hear their concerns so that they could be more adequately addressed in a future presentation. Wootten affirmed that her department is working with the project developers to ensure that their plans meet regulations for open land, open space, and mobile home parks. It was generally agreed that the site was being proposed with energy workers in mind. “It does not appear to be aimed at vacationers,” Howard remarked. He expressed concerns about the steep assent and relatively tight turn radius for RVs and trailers turning off Rocky Rift Road. Walsh said that the firm was requesting variances for both the smaller than normal turn radius and the 12 percent grade of the entrance way and assured board members that the turn was adequate. Howard noted that Walsh’s diagram showed vehicles entering via Rocky Rift Road from the direction of Lake Carey or Route 29. “Common sense and reality tells me that GPS is going to route them up Avery Station Road from Route 92,” he stated. Walsh addressed other questions about water, sewage, and the expected turnover rate of what were termed transient workers. Walsh was unsure of the expected turnover rate but noted that water and sewer plans and requests for permitting were under way. A relatively brief discussion about the SALDO followed Howard’s opening remarks on the topic. While everyone was in agreement that the ordinance needs a serious upgrade in the wake of the energy boom, Solicitor Jim Davis cautioned that there are limits as to what the planning commission can do in terms of regulating construction related to the gas industry. “I think we should do more,” Howard maintained, acknowledging that the current SALDO addresses very few of the issues generated by the gas industry, and criteria such a setbacks seem to be ambiguous and open to interpretation. For instance, the federal government regulates transmission lines but not gathering lines. Howard suggested that they should be treated the same. “A hazard is a hazard, until there is a better definition” he asserted. Board members and the solicitor backed away from any discussion about noise at gas sites. During the public comments portion of the meeting, Kristin Landon of Lemon Township thanked the planning commission for taking up the SALDO and suggested that even a 300-foot setback is not sufficient, especially when it comes to controlling noise levels. Noise from the Chapin dehydration unit is prompting complaints, she added. Howard gave his biggest push for more transparency and public awareness. “The issue is that people don’t know what’s happening. You need to notify all of the landowners and inform them of the proposed route.” Pipe diameter and projected psi should also be divulged to landowners within a “notification zone,” the diameter of which could be determined by the board, he continued. “I don’t know how we can enforce it,” said Davis. “We have to do something,” Marta Kovacs Ruiz interjected. The subject was tabled until the next meeting, which is scheduled for Wednesday, Dec. 18, at the Wyoming County Emergency Operations Center on Route 6 east of Tunkhannock.